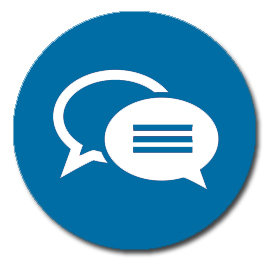 If you have any question or problem, please Contact us via e-mail and we will be happy to assist. We will do our best to answer within 24 hours. After initial registration, we will send you an e-mail. You will need to verify your e-mail address, by clicking the link. Next, you will receive a second e-mail with your login details. Enjoy a rich variety of samples to get to know the site, for an unlimited time. 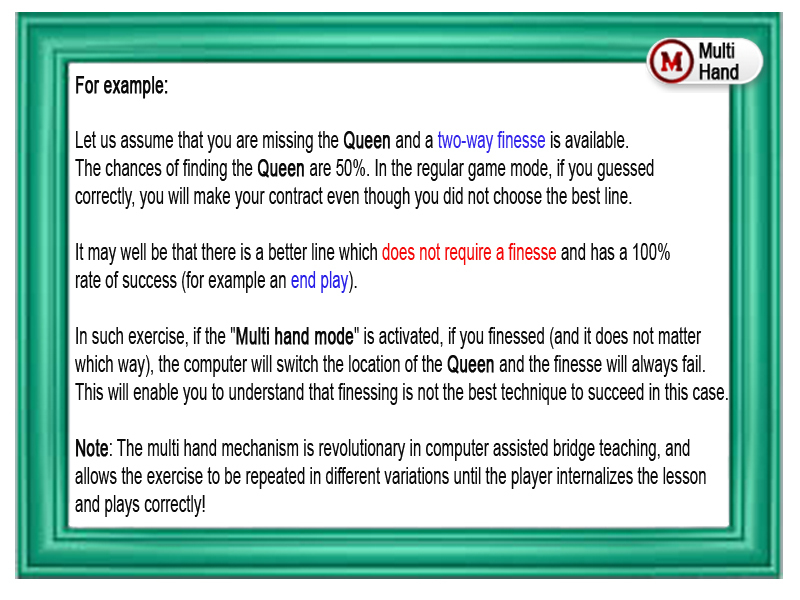 Two exercises in each Hand Play Level. Two exercises in each Defense Level. Access all content on the website as long as the subscription is valid. To select your favorite subscription plan, Click Here. We use the most secured online payment system (used by eBay). Your data is not saved on our site and is not seen by anyone but . You can pay with your account or with a credit card. The site is optimized for viewing in the Chrome browser or Internet Explorer 9 and above. Upgrade your Internet Explorer browser here. Click here or on the picture below, to learn about the different features of the software. Select a topic by clicking on the appropriate button. Click on the "Solution" button to view a detailed explanation. Choose a topic, by clicking on the topic's name (left side). To start the video, click on a lesson's name. Select a level by clicking the appropriate button. 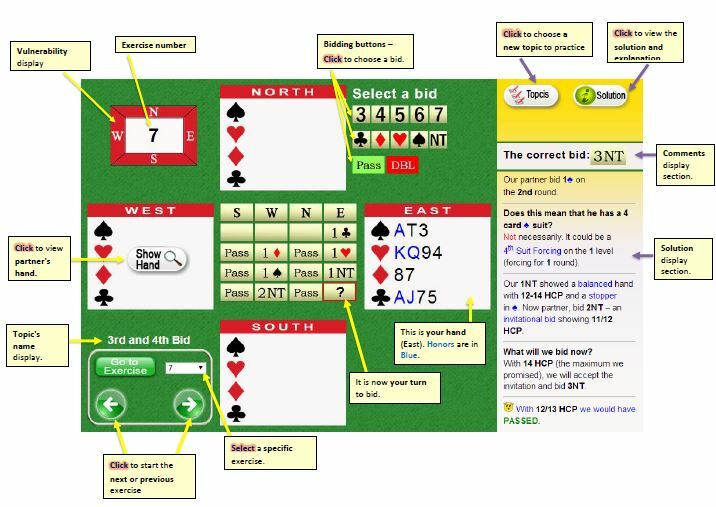 On the right upper corner, the bidding sequence will be displayed. In each exercise, you are the declarer (South). The dummy is always in North and is revealed immediately after the opening lead (from West). You need to find a way to generate enough tricks to make the contract. It is more important is to make the contract than to get overtricks (IMP system). In this way, you can focus on acquiring various game techniques, without being too busy trying to get overtricks. You play your cards and the dummy's cards yourself by clicking on the desired card. Opponent's cards will be played by the computer. By clicking on the "Next move" button, the computer will play all 4 player's cards. You determine the pace of the game. After all 4 cards have been played, they will be removed. If it's the opponent's turn, they will play automatically. If you want the computer to play for you, click on the "Next move "button. You can always view the last trick by pointing the cursor over the "Display Last Trick" button. Click the "Show hands " button to view the opponent's cards, Another click will hide them again. Click the "Try again" button to start the exercises again. Place the mouse over the "Display last trick" button to view the previous trick (There's no need to click). Click the "Solution" button, to view the recommended way to make the contract. The traffic light will guide you during the play. If you have made a mistake, that will prevent you from making the contract, it will turn Red. You can always click the "Previous move" button to undo the last trick and try a different way. We have developed a smart engine that will defeat you if you will not play in the correct way. Some exercises have an even more sophisticated mechanism of the multiple hands mechanism (Multi Hand). Exercises in which the Multi Hand mechanism is activated are marked with the Multi Hand button. 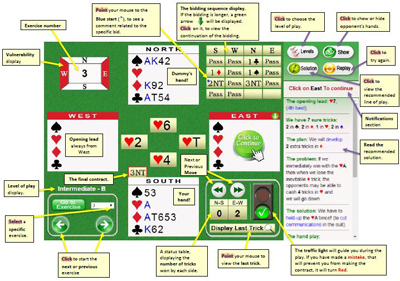 This mechanism allows the computer to hold multiple sets of the opponent's hands and always chooses the least convenient one for you , unless yo choose the best line of play. Please check your "spam" box – it may have been inadvertently diverted. Contact us and we will send it to you again. Make sure that you verified your e-mail address before the first login. Make sure that you typed the correct e-mail and password. Make sure that there are no spaces before or after the e-mail / password. An e-mail with your password will be sent to you. If you want to renew your membership, you should make a new order. If I make a new order, do I get to keep my login details? Yes! Your login details will not be changed when you make a new order. Login to the site (if you are not a registered member yet, you will need to register first). You can update your personal details if necessary. Read the Terms and Conditions and check the appropriate box to agree. Click the "Order" button to proceed to the payment form. If you have a account, just fill in your login details and make the purchase. If you don't have a account and you don't want to create one, click the "Pay with a debit or credit card" link. Upon completion click the "Pay" button, to make the payment. You may be offered to open a account but if you don't want to, just click the "No thank you" button. Once the order is complete, a message will be displayed on your screen and an e-mail with the order details will be sent to you. How to view in a full screen mode? How to increase or decrease screen resolution? Press on the CTRL button on the keyboard and at the same time press (+) to enlarge the screen / letters. Press on the CTRL button on the keyboard and at the same time press (-) to reduce the size of the screen / letters. What are the minimum requirements for watching online lessons? Anyone with a working computer and an internet speed of at least 1.5 MB/s can watch the lessons without any difficulty. Make sure your browser is updated (Use Internet Explorer 9 or above or Chrom browser). Is it possible to watch lessons on other appliances? Yes, It is possible to watch online videos with smart phones and tablets. How to enlarge the video screen? In default mode the screen resolution is relatively small (usually 680 X 480). To enlarge the screen press the enlarge icon from the toolbar at the bottom of the video. Enlarging the screen reduces the quality of the video. How to pause the video and then to continue again? Press anywhere on the screen and it will stop playing. Press again anywhere on the screen and it will continue.